Good, conscientious and effective customer service can make a huge difference to any business. From fledgling start-ups to well-established businesses, effective customer service will result in increased sales and profitability. In the case of a start-up or small business, your customer service team may well be just you, whilst in a larger business you may have a customer service team. In any case, there’s an important equation to take into account – effective customer service = satisfied customers = repeat business and referrals = more sales and more profit. It’s as simple as that. But, of course, in reality it’s not that simple because of one key word in that equation – “effective”. Customer service is a vital element throughout the sales process. It includes how well you showcase your wares or services; liaising with clients and customers; offering knowledgeable and useful advice and ensuring goods are delivered to timescale and in good condition. There is also after-sales care, which can involve dealing with queries and/or complaints; replacing faulty goods and advising with regard to product use. In all these areas we always come back to the key word – “effective”. It is a fact that some businesses pay lip service to customer service. We’ve probably all experienced this at one time or another and know that unhelpful, cursory customer care does not encourage us to do repeat business with a company whose customer service is ineffective. 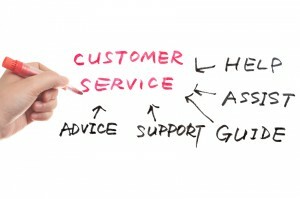 So – how to make sure your customer service is effective? First and foremost, good communication is the key to effective customer service. Customers need to know their individual requirements have been fully understood. So, the first step is attention; making it easy for your clients to communicate with you – be it in person, by email, fax, phone or post. If much of your business is generated on-line, you need to make it easy for your clients to contact you. In in-store situations, store clerks should be alert to customers looking for help and advice. In larger outlets, make sure your customer service desk is always manned and accessible. You clients need to feel that they have your attention. The next step is reception – customer service staff have to be able to receive your clients’ communications. So, an email address that generates an automated reply and no or delayed personal response, or an unmanned customer service desk or no clerks available on the shop floor is less than optimum. Customer service staff must be able to fully comprehend each customer’s needs – which process can be referred to as duplication of communication. Staff must be knowledgeable and ready to ask relevant questions to ascertain each client’s precise needs. This leads to understanding. Once your customer’s needs are fully understood, it is a much simpler task to offer appropriate advice or rectify any problems. What are the other factors needed for effective customer service? Obviously, businesses vary greatly depending on the goods or services offered, but the following remain constant. It may seem economical to put untrained, lower-paid staff on customer service duties. It really isn’t! It is of vital importance that those involved in all aspects of customer service have a good understanding of your business, services and products, as well as effective (that word again!) people skills. Investing in training customer service staff is a wise and profitable move. Often these staff are the face of your company – and you want your company to be seen to know what it is talking about! You can put together induction training to give a good overview of all aspects of your business. There are many good short courses available to help with communication and other essential people skills, and these can be an invaluable investment. Additionally, it is vital to treat your staff fairly and well, so that they feel valuable and can therefore be valuable to your clients. Which leads us to dealing with customer complaints. A key factor is always to maintain a positive attitude. Customer service staff need to focus on what can be done to rectify difficulties, not what cannot be done. For example, your customer will not be pleased to hear, “That widget you want is not available until next month. Sorry.” But if they hear the positive take on the situation – “We are getting that widget in stock next month. I can place your order right now and make sure it is sent to you as soon as it becomes available.” Can do – never can’t do. You and your customer service team must always aim to never leave a customer feeling their issue is unresolved. Help your staff by providing guidelines (not scripts) for a variety of likely scenarios. You can offer coaching and practise in positive flexibility. Staff should feel happy and confident in making experienced judgement calls when backed by management. The importance of adopting a personal approach cannot be over-stated. No one wants their queries, requests for advice or issues with after-sales care dealt with by automated messages or scripted responses. Clients want to communicate with a real live human being who wants to understand each individual’s requirements, give help as needed and never leave an issue unresolved. This may sound a lot to ask, but is actually very achievable using the vital communication rules and by providing training, support and consideration to your customer service professionals. Offer your staff your fullest backing and encouragement, thereby giving them the certainty that they are not only representing management, but that management is behind them and ready to help when bigger guns are needed. Don’t forget the importance of feedback. If you want to know what your customers think – ask them! Feedback from short, friendly Q & A and comments cards can prove invaluable in improving customer service. Remember that the customer is always right. Always. If a customer gets the wrong end of the stick, it’s still his stick! Knowledgeable and effective customer service staff will help him to understand the situation fully and get hold of the right end of the stick. Your staff can use effective communication technology to keep the customer right, whilst resolving any difficult situations. And make sure that management is on hand to help as necessary. Care for your staff with training, management back-up and validation of their skills and successes. Stick to the personal approach. The customer is always right. Use the personal approach and positive communication to turn that to your advantage. Get customer feedback and act on it. Above all, remember the equation – effective customer service = satisfied customers = return business and referrals = increased sales and profit. Win, Win, Win. This entry was posted in Observations & Answers on September 2, 2014 by Valerie.